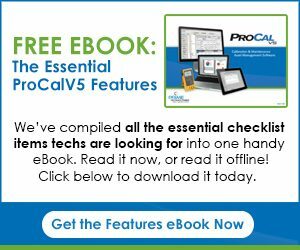 ProCalV5 software with Fluke Documenting Process Calibrators offers the “Best of Breed” fully-automated, cost competitive, paperless calibration solution that will improve productivity by 50% or more over antiquated paper intensive practices. For the single-user technician up to enterprise level managers, this comprehensive system eliminates human errors both in the field and during subsequent quality review. 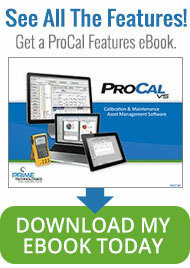 ProCalV5 incorporates all the functions of DPCTrack2! Ability to upload ad-hoc results saved from the “As Found” soft key to any tag in the system. Users must download tasks first before ad-hoc results. When downloading tasks, the user is able to define specific prompts on the calibrator for fields such as Man Hours, Calibration Type, Reason for Failure, Temperature and Humidity. Data is automatically saved during upload. User must always enter extra data in the system after upload. Ability to upload logged data. Not Available. Ability to download Manual Pass/Fail calibrations to the calibrator for entry of pass/fail state in field. Only switch and analog/proportional tests available. Ability to configure custom units using a base unit and range to display a different unit. Not Available. Ability to use the % of Scale display type for measure and/or source in their download tasks Not Available. Allows displaying the associated SOP Procedure text as a multi-page setup or wrap-up message. No side-by-side SOP document view, Prompts are limited to one screen at a time. Offers a Digital PV mode for HART Transmitters Not Available. Allows user to easily select between sourcing Current (“Source mA”) and Current Sink (“Simulate Transmitter”) on any instrument tag to be downloaded. Use of Simulate Transmitter mode requires a configuration workaround in most cases.